After more than 10 years of proven performance, the ABL800 FLEX blood gas analyser is now available in a new PLUS version. The ABL800 FLEX blood gas analyser allows you to measure a full panel of up to 18 STAT parameters on the same blood sample. With the new smart design and improved user interaction of the PLUS version, the ABL800 FLEX analyser makes your blood gas testing smarter than ever. Capable of analysing up to 18 STAT parameters on the same blood sample. Get the new ABL800 FLEX analyser brochure (no login needed). Login to the customer portal to download brochure, product specifications and other supporting material for the ABL800 FLEX analyser. 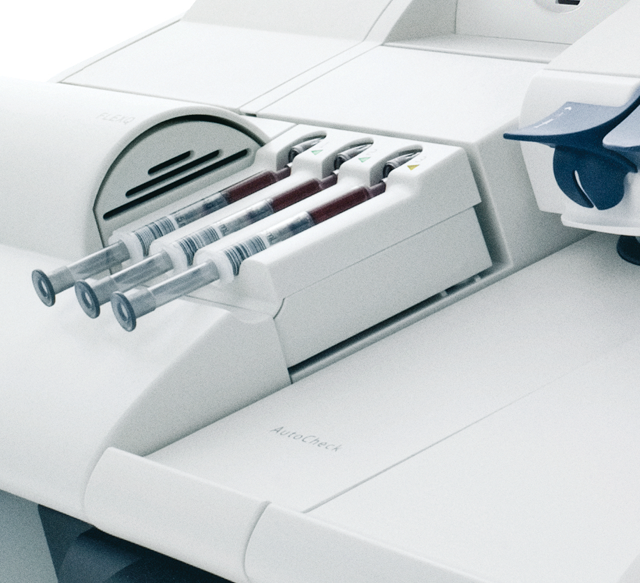 The unique FLEXQ module allows you to automatically analyse up to three blood gas samples in succession. With the ABL800 FLEX analyser's Drop'n'Go functionality, there is no need to wait at the analyser for patient results - simply place the safePICO syringe from Radiometer on the FLEXQ module, and the blood sample is automatically scanned, mixed and analysed. With the FLEXMODE functionality, the ABL800 FLEX blood gas analyser is also optimised for capillary tubes, allowing you to reliably get the most critical parameters from a low volume neonate sample. Easy-to use blood gas analysers measuring co-oximetry, blood gases, electrolytes and metabolites. Choose the parameter panel which suits your needs.